London is awesome. There’s no denying that. The accent, however, is out of this world. Ok, I shouldn’t be saying accent as we are the ones to come up with the language first. It is called English for a reason, you know… And yet, I wouldn’t be fair with myself or you guys if I were not to notice that the London’s touch on the tongue makes it rather unique, even among the numerous word twists and tongue breakers of the Isles. Thus, without further ado, I would like to introduce to a list of words that are destined to boggle an American mind! Where do the pants go? Let’s kick our list off with something easy. Sure this may seem like common knowledge to some of you, yet as I constantly work with foreigners whom I help with relocation, I also know that this knowledge could have prevented more than a handful of awkward stories. We don’t use the word underwear here in London. 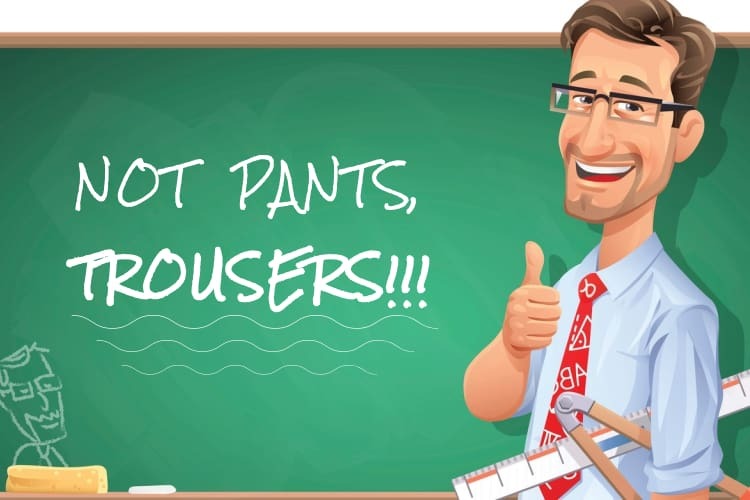 No, not because we don’t wear them, but because we call them pants. And the things you believe to be pants we call trousers. We love our tea here in London. We love it enough to even have a separate word dedicated to drinking it – cuppa. Don’t be confused with the world’s familiarity with the word “a cup” as cuppa doesn’t have a limit. If someone invites you for a cuppa, be prepared to spend the next few hours drinking liters (gallons) of tea. Also, note that cuppa is exclusive to the royal drink. You can’t say it in any other context like having coffee or alcohol. Oh, and by the way, we don’t have a limit for alcohol as well here in London so if someone invites you for a drink make sure to grab an extra liver because you’ll need it sooner than later. Yes, we do use the word bacon every now and then, yet it is not uncommon to also call it rashers in London. And, if you were to ask me, I’d say that we should use the word more often. It just has so much more flavor, if you know what I mean. Money, Pounds, Euros, Dollars, cash – you know, the good stuff. We call it the dosh in London. Some say that the word came to us as a combination of cash and dough but I have heard a different version once. One of my mates said that the word came from – as far as I remember – the Russian word for rain. And you know what? There is something very appealing and romantic about an idea of a money rain that simply warms my greedy little heart and night. Speaking of money will never be quote and quote broke in London. We’ll use a different word for it. You’re skint, the past participle of the word “skinned”. How poetic is that? Plonk is wine, but not the good kind of it, but the cheap clutter youngsters at parties like to illegally get drunk with. Apparently, it came from the sound of the bottle opening and while you won’t be hearing it as often as you grow older, if you are relocating to London to study – please add it to your vocabulary. Or don’t, because you know, drinking is bad for you and all that stuff that I am supposed to say as a responsive adult. London is a calm place filled to the brim with aristocrats. Just spit in whatever direction and you will hit a lord or a duke. At least we Londoners like to think of ourselves this way. And, for obvious reasons, we do not tend to lose temper. We are never pissed off or hysterical. We throw a wobbly instead. This is not a dentistry term, don’t sweat it. This is what we eat at carnivals AKA cotton candy as our American friends might call it. So, if you ever grow a sweet tooth in London, you now know what you want – candy floss. Don’t leave your home without one as this, as a scarf or a cab are among the symbols of London. A brolly is, of course, an umbrella. What do police officers and a nutritious breakfast have in common? Jam! A jam sandwich is a police car. This name came from the good old days were police vehicles were white with a red stripe in the middle – very much like a juicy strawberry jelly in between two slices of white bread. The times have passed, the cars are silver now and yet the name was sticky enough to stay. Get it? Sticky! Because jam! Speaking of sandwiches, The word butty isn’t used in a way you would assume. It is not the behind of a person. It is a sandwich with white bread, fries, butter and tomato sauce. Your turn, mates! Are there any other cool words or phrases you’ve heard in London but couldn’t quite put your finger on? Don’t be shy and share your stories in the comments section!